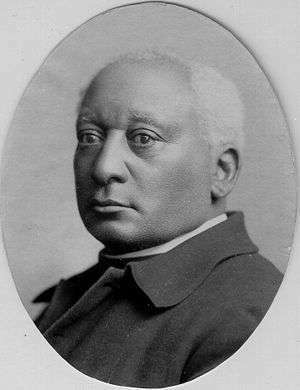 Benjamin W. Arnett (1838–1906) was an African-American educator, minister, bishop and elected official. He was born a free man in 1838 in Brownsville, Pennsylvania, where he taught school from 1859 to 1867. In his youth, Arnett lost a leg to an infection suffered after an ankle injury while working on a steam boat between 1857-58. As a pastor in the African Methodist Episcopal Church (AME), Arnett served parishes in Toledo, Cincinnati, and Columbus; under his leadership, St. Paul's Church in Urbana was completed. It has been designated as a historical landmark. In 1888, he was elected bishop, a position he held until his death in 1906. In 1872 Arnett became the first black man to serve as foreman of an otherwise all-white jury. In 1885, he was elected to the Ohio General Assembly from a district with an 85 percent white majority, thus becoming the first African-American to represent a predominantly white constituency. That same year another African-American, Jeremiah A. Brown, was elected from Cleveland, and the two frequently worked together. In 1886, as Republican representative from Greene County in the Ohio General Assembly, Arnett introduced legislation to repeal the state's "Black Laws,” which limited the freedom and rights of African-American residents. Arnett was particularly concerned that state law did not ensure that black children had the same educational opportunities as white children. In 1887, statues regarding education were changed; the state was thereafter required to provide equal opportunities to all children regardless of race. A forceful and compelling speaker, Arnett was influential in Republican politics, thanks, in part, to his friendship with fellow legislator (and later president), William McKinley. Bishop Arnett's influence is felt in the Pentecostal community. His great-grandson, Right Reverend Benjamin Terwood Douglass of Cleveland, Ohio, is the Seventh Bishop elevated in the Pentecostal Churches of Christ. Bishop Douglass serves as Secretary-General of that Reformation which has its roots in Methodism. ↑ African Methodist Episcopal Church, Ohio Historical Society, 2005-07-01. Accessed 2010-06-10. ↑ Ogden, John W. The History of Champaign County, Ohio. Chicago: Beers, 1881, 363.